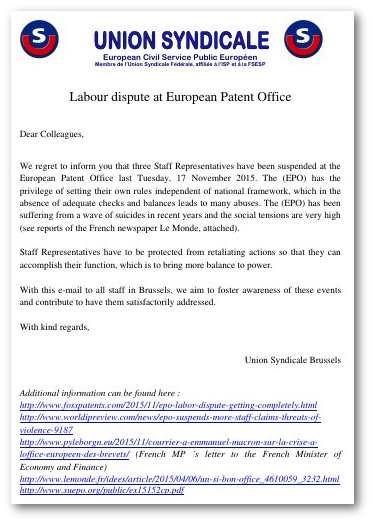 We regret to inform you that three Staff Representatives have been suspended at the European Patent Office last Tuesday, 17 November 2015. The (EPO) has the privilege of setting their own rules independent of national framework, which in the absence of adequate checks and balances leads to many abuses. The (EPO) has been suffering from a wave of suicides in recent years and the social tensions are very high (see reports of the French newspaper Le Monde, attached). Staff Representatives have to be protected from retaliating actions so that they can accomplish their function, which is to bring more balance to power. With this e-mail to all staff in Brussels, we aim to foster awareness of these events and contribute to have them satisfactorily addressed. Techrights too has experienced legal bullying, despite the EPO having no authority over Techrights (none of us is an EPO employee). –AnonymousTechrights is happy to support the actions or the messages of SUEPO. It has been disturbing and increasingly troubling to see what EPO management can get away with in Munich. People are either in disbelief or they just know nothing about it. Thankfully, in the coming days, a lot of the large press in the UK will shed light on these issues. Articles in English are also readable outside of Europe. And speaking of which, here is a new article in Portuguese (we need a translation as potential readers are only Portuguese or from former Portuguese colonies). We also welcome more leaks, especially those showing misconduct or bad conduct, rendering any leaker a whistleblower (who enjoys special protections, enshrined in law). Regarding the EPO/AC document leaked the other day, one reader wrote to tell us: “My jaw just can’t drop anymore, it’s now stuck to the floor. –AnonymousLook at the original document. It names this as “support of Directorate for External Communications.” That’s probably alluding to Director of External Communications Jana Mittermaier, who helped Siemens restore their 'normal' public image or at least save face after their massive bribery scandal. Remember what Bank of America (BoA) did right after it had discovered that material from the bank got leaked to Wikileaks? The authors and volunteers at Wikileaks wrote a great deal about it at the time. There was sabotage. See articles such as “Bank of America Employing Three Intelligence Firms to Dismantle WikiLeaks, Anonymous Responds With Hacks“. –AnonymousFor Bank of America, money wasn’t the issue. At EPO too, budget is a bottomless pit. They think they can just pay (not their own money because it’s a European public service) to achieve anything they want, even after erring, abusing the law, etc. Our reader continued pessimistically: “Expect agents provocateurs, industrial strength astroturfing, etc. “Or for that money, they could also attempt to buy opponents. Well, I have backups remotely stored — physically — at safe places, but in order to protect sources I never remove my laptop from my house. This is probably known to those who follow me in social media sites (like Twitter); airports and other such places are now checkpoints for digital data (encryption does not help as they can compel the traveler to decrypt everything or face serious trouble). –AnonymousGiven the appealing treatment that the suspended judge and staff representatives have been subjected to (military-grade interrogations and de facto raids), we must prepare for the worst. The legal bullying was a serious escalation in tactics, only months after the EPO had blocked this site. Our reader added: “Have you heard of the Netzpolitik.org affair in Germany? The minister of justice tried to shut up a group of Internet activists and critics who had the tendency to present very interesting stuff that was leaked, or even legally obtained using FOI laws! “If not, you might do well to look into this, as I see parallels. “The AG tried to shut them up by using an A-bomb: TREASON LAW! –Anonymous“That caused a general uproar. “You should perhaps get in touch with them, with the magnitude reached by this business, I think you need all the publicity you can get.